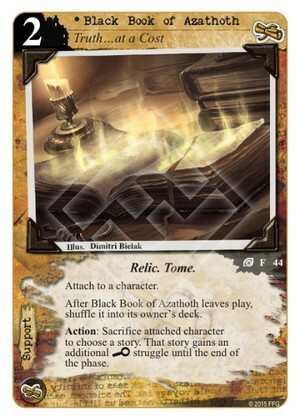 After Black Book of Azathoth leaves play shuffle it into its owner’s deck. Action: Sacrifice attached character to choose a story card. That story gains an additional (I) struggle until the end of the phase. You could fetch this with Whitton Greene to further accelerate acquisition of success tokens when you need it most... i.e. wrap up the last story and win. But unless your deck derives strong synergies from the mere presence of tomes around, that's just a 2 card play to win 1 token - not even guaranteed. 1/5. I wonder why this card isn't an Attachment? Er, if you attach it to a character, it is an attachment, subtypes notwithstanding ... I think. But maybe this card would fail to qualify in a deck search for an "Attachment card" (using, e.g. Evidence Locker). Could you attach it to Dr. Bancroft? I guess you could attach it to Doctor Bancroft. I don't know that you'd want to though. The two don't really seem to complement each other. And you're right (I think) about Evidence Locker.